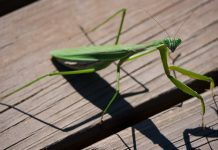 Female praying mantis are always bigger than the males almost two to three inches greater in length. 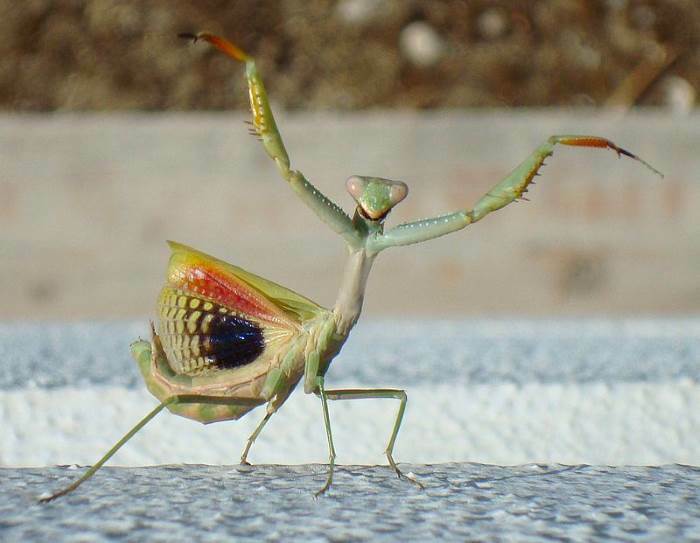 The female mantis isn’t only bigger it is also comparatively aggressive. 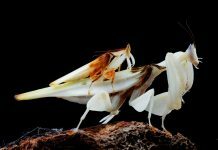 Even so, female praying mantis are more likely to demonstrate cannibalistic behavior than the males. Sometimes when they are too hungry they might eat the male either during or after mating. Therefore, males sometimes approach the female from behind to get away with their cannibalism. Female mantises are also revered by people in different cultures. 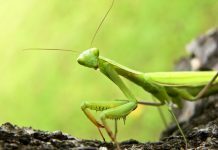 The length of the female praying mantis is about 10 inches with the weight averaging 4 to 5 grams. They have set of seven sternites each of which is clearly visible. Just to let you sternites are the ventral portion or abdomen of arthropods. While most females are largely recognized by their green color some however exhibit gray appearance such as the Carolina mantis. The green color provides them perfect camouflage against predators as they can afford to sit atop tall grass without being noticed. Adult female Iris oratoria performs a bluffing threat display. 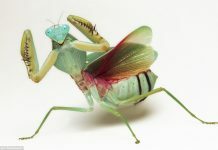 Female mantis do have wings but they can’t fly. Thus, it’s not up to them to look for males during mating season. Males typically fly and search the female by following pheromones that are released by the latter. It is also logical assume that females are relatively less mobile. They will rear back with the forelegs in an attempt to thwart the predator with their mouths opened and so as the wings. 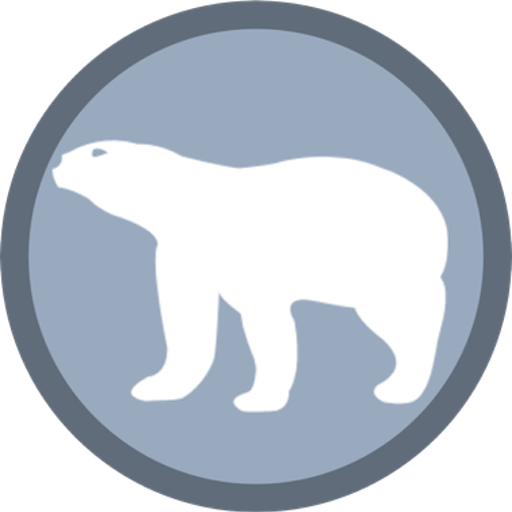 Adult females likely display a unique set of posture especially if they feel threatened. They will rear back with the forelegs in an attempt to thwart the predator with their mouths opened and so as the wings. Depending on species, the female lays 20 to as many as 400 eggs. The eggs are laid in protective casing known as ootheca. They may lay eggs either directly on the plant or on the ground. Although the eggs are protected in a case they are eaten by a certain wasps. 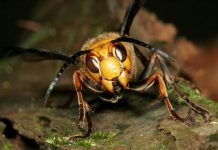 Prominent among the female’s behavior is its cannibalism. It cannibalizes her mating partner and is most likely to choose smaller males. Since the female mates with multiple males the cannibalism behavior is something that they can’t avoid. Soon after copulation the female eats the male’s head first followed by its abdomen. Sometimes however they leave the dead male after beheading it. Dickie, S. (1996) Parthenogenesis in mantids. Mantis Study Group Newsletter, 1: 5. Bragg, P.E. (1996) Mantis, Mantid, Mantids, Mantises. 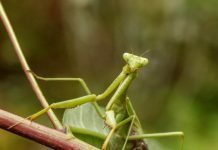 Mantis Study Group Newsletter, 1:4.